Must have GIZMOS: Turn Warm Beer to Ice Cold Beer in Seconds; Without Ice! Turn Warm Beer to Ice Cold Beer in Seconds; Without Ice! A young 22 year old inventor, by the name of Kent Hodgson, has found a way to almost instantly chill a beverage without using any ice. His relatively simple idea uses liquid CO2 to turn a warm beverage into a cold one within seconds. The usefulness of a small device such as this one is endless. It could eliminate the need for hauling around those huge coolers to the beach or to a barbecue. It can also save space in your refrigerator by not having to put huge cases of beer, or other drink, into the fridge, and instead cooling the drink right before you actually drink it. Also, this device does not dilute the drink, like ice does. 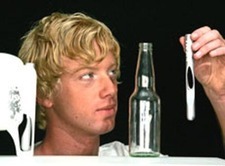 The device is slightly larger than a pen, and it is expected to cool a case of beer with one canister of CO2. At this rate, it is estimated that it will cost about 7 cents to cool each beer. Well worth it, if you ask me, to have a warm beer turn ice cold within seconds. Kent Hodgson calls his invention Huski, and he is currently showing the device at an exhibit at the Design Exposure 2007 at Britomart Pavilion. He is currently working on patenting the device, and expects to retail it for about $50.